Enterprising women have accomplished many feats around our region. Meet four women who’ve followed their passions into truly exceptional callings. 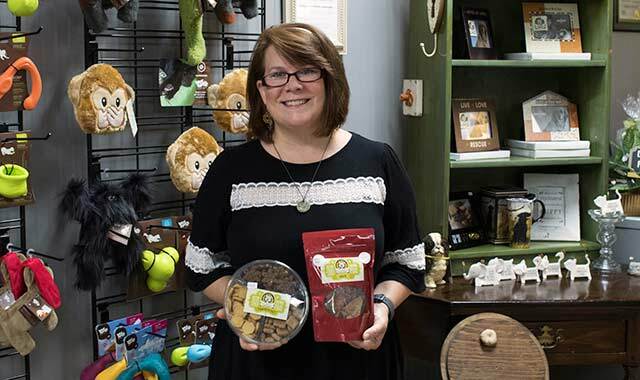 Jane Femminella, owner of the Canine Crunchery, has embarked on a dog-pleasing business adventure that entails plenty of excitement. Sometimes, we find our true calling in the simpler, hands-on things of life. Meet four women who have turned their passion into successful careers. Jane Femminella had a problem. Her dogs couldn’t eat treats because of their special dietary needs. The solution? To develop special recipes and bake her own dog biscuits. Femminella had not planned to own a baking business for dogs – in fact, the Rockford resident received a B.S. in Education from Illinois State University and taught children in daycare, then worked in a pediatric dentistry office. But in 1996, when she first started baking for her canines, she gave away some biscuits to her neighbors. The neighborhood dogs loved the treats so much that their owners reported doggy tantrums if the pups walked by and Femminella wasn’t home. “People then started offering to buy treats and I thought maybe we were on to something,” she says. She began small, selling to people she knew and at local farmers markets. She opened her first bakery in Loves Park in 1998, but the business only lasted a few years. She went back to working in another field. In 2011, she started baking in her kitchen, again, while working at the dentistry office. She baked during evenings and packaged up treats for some old clients during mornings. Some area stores were asking for her product again, too. In time she grew busy enough to quit her day job. As demand skyrocketed, she twice changed locations before landing at at 1422 20th St., Rockford in 2015. Femminella now sells the treats from about 28 area stores plus stores in Wisconsin, Florida and Michigan. What makes dog treats from The Canine Crunchery so appealing? Femminella tests the products out on her own three dogs, as well as her pet rabbit. She researches products thoroughly before using them. Femminella derives satisfaction from seeing people give treats to pet dogs who were never before able to enjoy them. Along with dog treats, The Canine Crunchery also sells locally made items like candles, pet sweaters, pet toys, artwork and collars. The shop also hosts pet-friendly events, pet adoption meetings and fundraisers. Femminella strives to keep her life balanced, in part by closing her shop Sundays and Mondays and getting home at a reasonable hour. Her husband and one of her daughters work with her in the shop, and two other daughters contribute to the business. The family oriented nature of her business helps her to keep stress at bay. Her advice to other aspiring entrepreneurs? Being cooped up indoors just wasn’t the right lifestyle for Lynn Lein, who is much happier running a farm. She makes sure that her 30,000 “girls” enjoy a lifestyle that anyone would crow about. Yuppie Hill Poultry Inc., Burlington, Wis.
Burlington, Wis. resident Lynn Lein grew up in Milwaukee and spent her summers visiting a friend’s dairy farm. She enjoyed it so much that she fancied having her own farm one day. Lein worked in the healthcare industry for many years before buying a home with five acres in Burlington in 1994. At first, she simply housed a few horses. Then, her two sons brought home 12 laying hens. “We made a fancy coop complete with drywall and curtains,” she recalls with a laugh. In the beginning, it was enough to provide eggs to her three children, close friends and neighbors. In time, she had a few hundred birds. Neighbors stopped by to check out her flock’s unique living quarters and dubbed the birds “yuppies” because of their posh lifestyle. Thus, the name Yuppie Hill Poultry was born and word got around that Lein was selling fresh eggs. She began selling them through retailers and restaurants in Milwaukee and, in 1999, left behind the world of healthcare to focus on her dream. In 2004, Lein moved to an 8-acre farm at W1384 Potter Road with several barns that she turned into high-quality living quarters for hens. The hens live cage-free, but are not permitted outdoors. Lein is protective of her “girls,” the lifeline of her business. The flock now numbers around 30,000, and Lein works hard to keep them healthy and stress-free. She even traveled to England to study humane aviary systems. The well-ventilated barns have state-of-the-art feeders that allow for the cage-free environment. Along with selling to area restaurants and stores, Lein works with two main distributors and participates in one farmers market. She also raises broiler hens, Berkshire pigs and turkeys. People can stop by her farm and purchase meat and eggs at their leisure. Lein also runs The Hen House Café from her property, a small restaurant offering farm-fresh dinners at select times of the year. 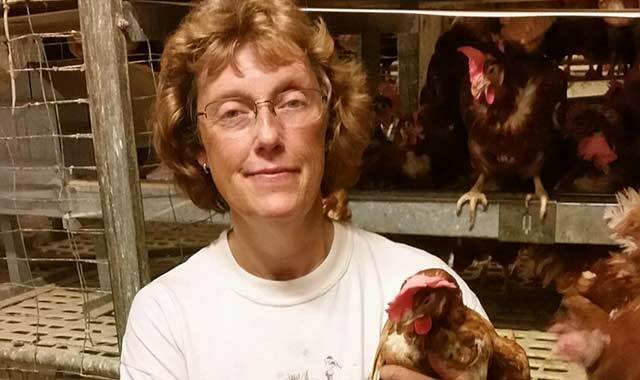 So how did Lein turn a dozen hens into a booming business? She says she’s had a lot of help along the way, first from her parents and later from her children. Her two sons still help her. But her success has also been the result of sheer determination and perseverance. The best part of her job, she says, is being around “her girls,” and providing customers with healthful products at an affordable price. Farming is a full-time commitment, not something that can be easily started and stopped, Lein notes. And it’s not easy for small farmers to make a go of it, financially. But in the end, for her, it’s been worth it. Linda Dee Derrickson managed many business ventures before her “itchy feet” took her back to her farm roots. Today she’s as content as the wooly friends who keep her company. Bluffwood Landing, New Glarus, Wis. 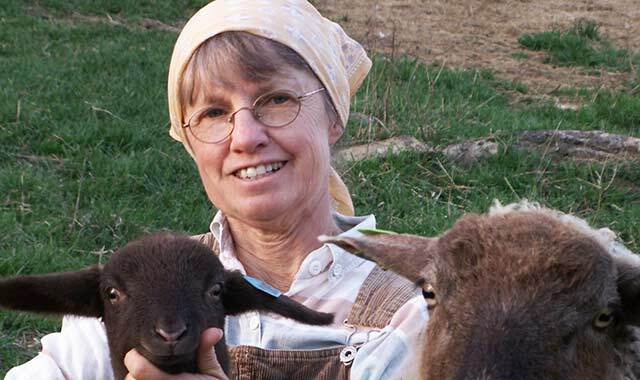 Most days you can find Linda Dee Derrickson tending sheep, llamas and gardens at Bluffwood Landing, her farm near New Glarus, Wis., where she also maintains a fiber business. Her farm is home to a small flock of endangered heritage sheep – guarded by her llamas – as well as annual and perennial vegetable and flower gardens. She farms bio-dynamically, using principles of herbal and homeopathic wellness. She also runs workshops and sells pelts, yarns, roving wool and raw fleece. Derrickson’s life is a bit quieter than it used to be. She grew up on a southwestern Wisconsin dairy farm, but her parents didn’t want her to become a farmer. “My parents thought it was a hard life and encouraged us to go to college,” she says. She graduated from the University of Wisconsin with a degree in Home Economics. Then, she married and joined the Peace Corps with her husband. They returned two years later with a new addition to the family, then adopted another child. Derrickson stayed home with her children until she divorced and moved to Madison as a single parent. That’s when her adventures in the world of business began. Derrickson grew bored providing in-home daycare services and working at a law office. She obtained funding to open a unique grocery store that sold things like homemade sprout sandwiches and tofu alongside Twinkies and cigarettes. This led to more opportunities. With a partner, she purchased an art gallery cafe and founded a char grill restaurant that also offered vegetarian fare. It was the first nonsmoking restaurant in the area and soon won accolades. She remarried and bought another restaurant, this time in a rural location near Mount Horeb. She and her husband moved there and later sold the Madison restaurant. The rural restaurant didn’t meet expectations, so they closed it. The couple purchased an adjacent homestead, where they launched a successful bed-and-breakfast and established a residential community focused on social cohesion and teamwork. By 2004, Derrickson was ready to embrace full-time sustainable farming. The couple sold the Mount Horeb properties and purchased a 154-acre farm near Blanchardville where they raised livestock and sold beef, pork and lamb. Derrickson milked goats and learned how to spin yarn, all while hosting people still interested in the intentional community lifestyle. After a decade, the couple decided to scale things back a bit. They moved to their current farm in 2014, where Derrickson focuses on her sheep and llamas, building up her fiber business and growing food for her table. She finds contentment walking out among her sheep and embracing the spiritual aspects of farm living. Looking back on all her business ventures, Derrickson reflects on the ways she balanced work and family. 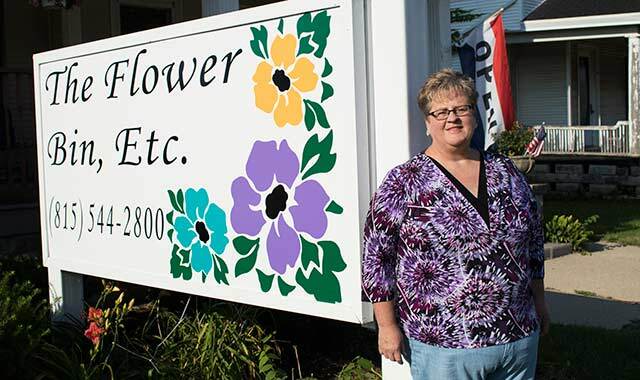 Denise Carlson has seen her small floral business blossom. She enjoys the constant variation and new challenges that each new day brings. The Flower Bin ETC., Belvidere, Ill. Loves Park resident Denise Carlson has always had a passion for flowers. That passion, combined with her family’s natural talent for hands-on creativity, has fueled her business ambition. Carlson first learned a lot about flowers from her mother. As a student at Harlem High School, she began working at a local flower shop at age 16. After four years in that shop, she moved to another florist shop in Rockford, learning more tricks of the trade. Thirteen years ago she purchased her own place – The Flower Bin ETC. in Belvidere, Ill. The Flower Bin offers both fresh flowers and unique gifts. There are sympathy and wedding arrangements, bouquets for special occasions and an array of interesting wares from dish gardens to home décor pieces. Carlson enjoys coming up with new and improved items and is fond of ‘upcycling’ – turning old items into new treasures. Carlson hosts special events such as bridal shows and classes for Girl Scouts and 4-H groups. She’s living her dream but concedes there are many challenging days. The support of family members, friends and staff members makes a huge difference. Carlson’s two sisters work as accountants in the store and her mother works in the shop. Her father makes unique gift items from barn wood. “My support staff treats the store as if it’s their store,” she adds. Carlson enjoys doing custom floral jobs and making people happy. This entry was posted on Thursday, September 8th, 2016 at 11:59 am	and is filed under Northwest Woman. You can follow any responses to this entry through the RSS 2.0 feed. Both comments and pings are currently closed.